Robert William Gavaghan, Jr. was born in Flushing, New York to Robert William and Marjorie (Nelson) Gavaghan on June 3, 1943. He passed at the age of 75 on March 31, 2019. Robert possessed a wonderful sense of humor that was very dry, sly, and witty. He was open-minded and accepting of all people and could always be counted on in times of need. Robert married the love of his life, Lynda (Botts) Gavaghan, in St. Louis, Missouri on December 16, 1972, and to this union was born one daughter, Erinn, of whom he was a loving and protective father. Robert enlisted in the United States Coast Guard upon graduation from high school, and after 22 years of service he retired on December 30, 1981 with the rank of Master Chief. During his service he performed many duties, most notably as an officer for search and rescue missions. Robert’s time in the military bred into him a strong sense of ethics, a trait which he held in very high esteem and that helped him in his post-military careers in loss prevention and law enforcement. Robert also was a volunteer fireman and worked for a time in an office position for a ship builder. Robert was an avid adventurer and outdoorsman. He loved to go camping with his family and he never missed an opportunity to fish (be it fly fishing or with a traditional rod and reel) or to hunt (usually deer and moose). Robert also became enthralled with geocaching, and at one point he joined a geocaching club. 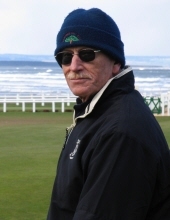 Another outdoor passion of Robert’s was golf; he was able to play St. Andrew’s in Scotland, one of the highlights of his life, and he participated in many tournaments. In addition to spending time outside Robert loved to read, especially National Geographic and “guy books” such as detective mysteries and history and science books. Robert was preceded in death by his parents and his brother, Michael Gavaghan. He is survived by his wife Lynda and daughter Erinn Gavaghan, both of Norman, Oklahoma, and sister Sue Maltais and her husband Randy of Concord, New Hampshire. Expressions of sympathy may be sent in the form of a memorial contribution to Central Oklahoma Humane Society (https://www.okhumane.org/donate/memorial-donations/), Operation Home Front (https://www.operationhomefront.org/donate/2247), or the Norman Arts Council (https://normanarts.org/support). A celebration of Robert’s life will take place at 2:00pm on Sunday, April 14th at the Cleveland County Veteran’s Memorial in Reaves Park (2501 Jenkins Ave, Norman) followed by a reception at MAINSITE Contemporary Art (122 East Main St, Norman). To plant a tree in memory of Robert W. Gavaghan, please visit our Tribute Store. Please join the family for a reception following the service. "Email Address" would like to share the life celebration of Robert W. Gavaghan. Click on the "link" to go to share a favorite memory or leave a condolence message for the family.